Welcome to North Lake School’s Primary Grades. North Lake School’s curriculum is aligned with the Common Core State Standards in English Language Arts & Literacy and Mathematics. Science, social studies, and specialized classes are guided by the Wisconsin Academic Standards. The overall instructional program is balanced and integrated through thematic grade-level units. The goal is to provide enriching experiences through learning activities that support our school mission. Students are actively involved in the teaching and learning process as they discover new knowledge, develop positive attitudes, and communicate effectively with our school community. 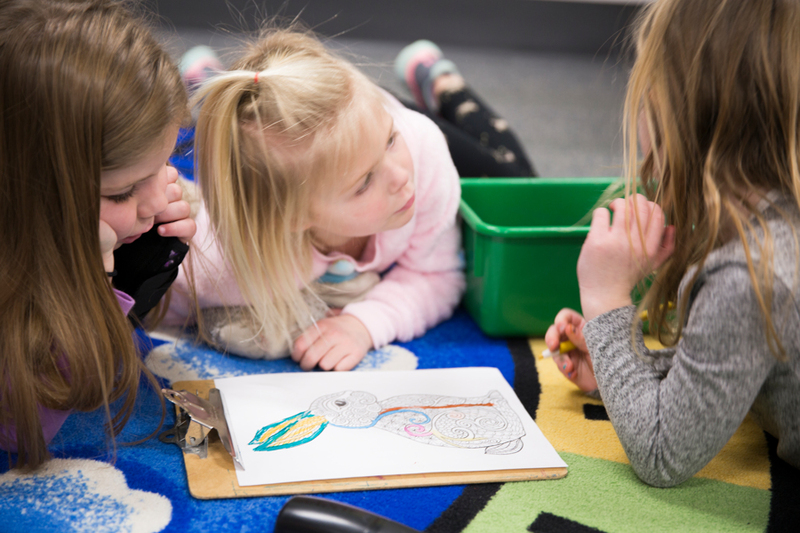 Four year old kindergarten through second grade are organized in self-contained classrooms and focus on meeting the needs of individual students. Strong foundational skills in reading, writing, and mathematics are taught and assessed by our team of primary teachers. Lake Country Kindergarten Preschool is a non-profit, licensed, cooperative 3K & 4K preschool created for the kids they educate through partnerships among certified teachers, parents & caregivers. LCK families embrace hands on activities, small class sizes, and a fun, loving environment in bright, colorful learning areas. The 4K program is housed at North Lake School in Room #101 and fosters each child’s excitement for learning and feeling of safety, comfort and independence in the classroom. If your school district has a 4K program, then LCK 4K is tuition free when you apply for North Lake School District’s Open Enrollment process through the State of Wisconsin’s Department of Public Instruction. LCK has wrap around care right at North Lake School, and any kids needing care past 2:30pm are then transitioned to North Lake’s Extended Care Program. Welcome to Kindergarten! Five-year-old Kindergarten at North Lake School is full of wonderful experiences and explorations. Every day is filled with excitement and a robust energy for learning. We Kindergarten teachers are thrilled to be working with your child and being part of his or her first steps toward life-long learning and social participation. Our curriculum and daily subjects are listed below. The kindergarten newsletter, sent weekly by the teachers, is also a great resource for current happenings in 5K! Much of our morning is devoted to Reading and Writing. Reading is taught through phonemic awareness, literature and phonics, which include fun activities and stories that assist young children in understanding the relationship between letters and sounds. We also work on mastering sight words, with the help of the word rings each student has for practicing. We use the Houghton Mifflin Harcourt JOURNEYS reading program as well as guided reading books that are rotated at a weekly basis. The desire to read is nurtured and increased when a young child is read to often, which in our classrooms are daily. Eventually, children will utilize reading skills and strategies they have learned to decode words on their own. Your child will receive their guided reading books by way of a book bag. This bag will contain a few books at your child’s reading level, along with the word ring with sight words on it. Our writing program builds on what the child already knows. Writing begins with scribbles, and proceeds to circles, lines, random strings of letters, words and spaces and eventually sentences. Please celebrate all the stages of writing. We will begin by having the students write to the best of their ability with the teachers writing under the phrases and sentences. We transition into the proper parts to a sentence, such as capital letters in the beginning and periods at the end. We finish with writing full sentences and stories with a beginning, middle and end as the year progresses. Our handwriting program in the primary grades is Handwriting Without Tears. This research based curriculum promotes healthy handwriting habits to last a lifetime. They also come with phrases to help us remember how to make our letters and numbers. We are excited about our Houghton Mifflin Harcourt Math Expressions math program. This program includes many hands-on and interactive lessons to help create the foundation for the students’ mathematical understanding. Children discover the world of math by practicing skills such as sorting, classifying, patterning, measuring, and estimating. The program is a blend of direct instruction and independent or group center work. We will read and send home practice that focuses on specific math concepts as well. In our STEM units children learn about structures and functions of buildings and parts of our bodies. They also learn about themselves and the world around them. We also expose children to informational text in our themes such as dinosaurs, oceans, plants, insects, frogs and chickens, Presidents, and holidays around the world. Most of our Science and Social Studies is taught through our weekly themes. To help the students master their new skills learned at school, there will be a “homework” packet sent home at the beginning of the week. The pack will only have a few pages which focus on new skills. This pack will be due back by the end of the week (mostly Fridays with those occasional Thursdays). Our special classes are Art, Music, Library, Guidance, and Physical Education/Health. It might be helpful to leave a pair of gym shoes in your child’s locker. Your child will have Library once a week. Children may not check out new books until the old ones are returned. Snack time is in the morning before our specials. Please pack a healthy snack for your child each day. Some examples of healthy snacks are fruit, vegetables, granola bars, fruit snacks, yogurt, pudding, etc. Remember that nothing containing peanuts or tree nuts is allowed in the classrooms due to severe allergies within the building. Check the labels carefully. Please do not send chips, cookies or candy. Pretzels are fine. The children are also given milk at this time. Some children think their snack is their lunch or eat their lunch at snack time. PLEASE help your child by letting them help you pack their snack, or by placing their snack in a different bag or area of their backpack. Also, please read the lunch menu and discuss whether they are having hot or cold lunch each day. If they are having hot lunch, please discuss which entrée they should choose. Rest time begins around 1:05 and ends at 1:30. The children lay on their towels and listen to relaxing music or books on tape. Some children rest while others nap. Rest time is incorporated into the day at the beginning of the year and by the end of the year we have transitioned out of rest time and into quiet work time. Welcome to First Grade. Our teachers are very honored to have your child in their classrooms. First grade is a very exciting year for your child and your family. The growth that is made during this year is tremendous. By working together, teachers can assist your child in having a very positive experience at North Lake School. First grade classrooms are based on routine and expectations. As always, teachers’ doors are always open to parents. Reading is such an important part of the first grade curriculum. Becoming a reader is also a wonderful step for each child in the learning process. The first grade language arts curriculum is derived from the Houghton Mifflin Harcourt JOURNEYS 2014 program. Journeys is a K–6 reading program that provides a balanced approach to literacy instruction. Journeys digs deeper into complex text and engages students in classroom discussions about essential questions. Journeys differentiates to meet all learners’ needs, provides multiple opportunities for learning, and personalizes intervention for specific readers. Journeys raises the bar with apps, Interactive Whiteboard Lessons, eTextbooks, online student and teacher collaboration, & research and assessment. For specific first grade learning targets, please contact your child’s teacher. Our handwriting program in the primary grades is Handwriting Without Tears. This research based curriculum promotes healthy handwriting habits to last a lifetime. In first grade, our math program, Math Expressions by Houghton Mifflin Harcourt includes many hands-on and interactive lessons to help create the foundation for the students’ mathematical understanding. Math Expressions combines the most powerful elements of standards-based mathematics with the best of the traditional approaches. Math Expressions emphasizes in-depth mathematics through real world problem situation, modeling, conceptual language and Math Talk to help students build mathematical ideas that makes sense to them. The program is a blend of direct instruction and independent or group center work. For specific first grade learning targets, please contact your child’s teacher. •	Light & Sound – All products created by designers and engineers were created to meet a human need or want. One of the most basic of human needs is to communicate over a distance. In this module students will investigate light and sound, including vibration from sound waves and the effect of different materials on the path of a beam of light. The students will use a design process to sketch, build, test, and reflect on a device that uses light or sound to communicate over a distance. •	Animal Adaptations – In this module students are presented with the problem of preparing an ideal traveler for a visit to an extreme environment and designing the ideal shoe for this traveler to wear in this environment. Students will look to plant and animal adaptations to guide them as they make choices about how to prepare their traveler. Students will learn what it means for an organism to be adapted to its environment and how different adaptations can be categorized. Through various investigations, students will explore an example of adaptations for protection, camouflage, food, and locomotion. They will complete an inquiry investigation to explore how different beak shapes are best adapted for gathering different foods. They will then investigate organisms that live in an extreme environment and document the variety of adaptations that each of these organisms display. Students will combine all of their knowledge of plant and animal adaptations with their understanding of the extreme environment to prepare their traveler and design their shoe. Welcome to Second Grade. Second grade is a wonderful year because the children grow in knowledge, confidence, and ability. They willingly take a more active role in their own learning, and North Lake School’s second grade teachers truly enjoy being a part of that growing process. Cooperation between home and school is treasured. Second grade is a gift of continued learning- socially, emotionally, and academically. Reading continues to be an integral part of the primary curriculum. Second grade language arts curriculum is derived from the Houghton Mifflin Harcourt JOURNEYS 2014 program. Journeys is a K–6 reading program that provides a balanced approach to literacy instruction. Journeys digs deeper into complex text and engages students in classroom discussions about essential questions. Journeys differentiates to meet all learners’ needs, provides multiple opportunities for learning, and personalizes intervention for specific readers. Journeys raises the bar with apps, Interactive Whiteboard Lessons, eTextbooks, online student and teacher collaboration, & research and assessment. For specific second grade learning targets, please contact your child’s teacher. Math Expressions (Houghton Mifflin Harcourt) is our math curriculum for second grade. Math Expressions combines the most powerful elements of standards based instruction with the best of traditional approaches. Math Expressions uses objects, drawings, conceptual language, and real world situations to help students build mathematical ideas that make sense to them. For specific second grade learning targets, please contact your child’s teacher. In this unit, students will discover and discuss wind and methods that engineers use to capture its energy. These concepts will be reinforced with an accompanying storybook, Leif Catches the Wind. Throughout this unit. students focus on activities related to how the wind can do work and how to design mechanisms that utilize wind power. In this module students will explore how the surface of the Earth is always changing.They will be introduced to different kind of maps and explore how these maps convey different kinds of information about the world we live in, including where water is found on Earth. Students will investigate the different forces that shape the surface of the Earth and design solutions to limit the impact of erosion on a fictional community.